In Putin’s Russia, similar insults, threats and comparisons are not uncommon. Russia joined North Korea’s Stalinist comrade regime in its outrage against the controversial feature. “The very idea of the film is so aggressive and scandalous that the reaction of the North Korean side … is completely understandable,”said Russia’s foreign ministry spokesman Alexander Lukashevich. 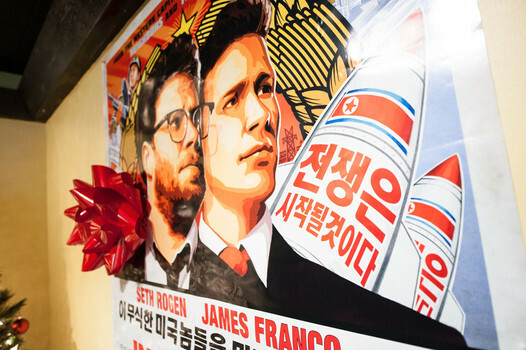 North Korea continues to deny involvement in a crippling cyberattack against Sony Pictures. Russia supports Pyongyang’s denials, noting that the US is yet to provide any evidence of North Korea’s involvement in the Sony hack. North Korea’s National Defense Commission’s spokesman accused Washington for intermittent outages of North Korean websites this week, after the US had expressed its intent to retaliate for the hacking of Sony Pictures. Washington denied responsibility for North Korea’s Internet outage. North Korea and the US technically remain in a state of war, since the 1950-53 Korean War ended with an armistice and not a peace treaty. The West and North Korea are at odds over Pyongyang’s nuclear program and severe human rights abuses. Last month, Russia ran interference by opposing UN resolution condemning North Korea’s human rights record. Addressing those issues would bring into focus Russia’s own human rights issues. This is especially true, since the isolated dictatorship of North Korea is providing workers for the secret labor camps in Siberia. North Korean laborers live and work in deplorable conditions, with terms ranging from three to ten years. Putin invited Kim Jong-un to attend the 70th anniversary of the Soviet Union’s victory over Nazi Germany in World War II, on May 9, 2015. Russia is closely entangled with the reclusive state and both countries plan to continue widening social and economic ties. Russia’s Gazprom wants to build a gas pipeline through North Korea, to provide natural gas exports to South Korea. Russia’s politicians and talking heads see North Korea as a partner in the grandstanding between post-Soviet holdouts and the West. Russia’s ideologue Alexander Dugin advocated that Russia should give nuclear weaponry to North Korea as the last refuge of communism. North Korea recently threatened to “blow up” the White House, the Pentagon and other US targets.